I just got back from Glasgow where I spent the weekend with the West of Scotland Guild of Spinners, Dyers and Weavers. The guild meet once a month in Milngavie and I was asked to come and give a talk and run a felting workshop well in advance. Infact Jill from the Guild had asked me two years ago -so no amount of snow was going to stop me getting there after all that time in my diary! I prepared a talk about the History of Natural Dyeing, in Scotland and worldwide. I focused on rural dyers in the Highlands and Islands and then moved onto city dyeing and the industrialization of the dye industry. The dye trade lead me to focus on certain imported dyes including Indigo, Cochineal and Madder and their origins. I have always had an interest in the origins of dyes and researching some of the oldest dyed textile remains was fascinating, with some of the oldest remains being found in the Americas, Africa and China. I have been lucky enough to have traveled in South and Central America and to have found what I think is naturally dyed textiles. It is sometimes difficult to tell, but when I compared the dye colours of these pieces with more modern local textiles, the colours looked far more natural and had faded in the way I would expect natural dyes and not synthetic dyes to fade. I have a beautiful piece from Peru, dyed with Cochineal. While in the hills of Vietnam I picked up a embroidered Indigo dyed jacket. The process of dyeing with Indigo differs all over the world, although the principle of fermentation is the same. In Vietnam I remember walking along the mountain paths and Indigo growing everywhere, many of the woman who dyed with it had blue hands from their work. It was great to be able to illustrate my talk with dye photos and textiles to pass around – keeping everyone going! In the afternoon I ran a felting workshop -wet felting using Shetland and Cheviot fleece, naturally dyed with plant dyes. Some really lovely pieces were made, in the little time we had and those who wanted to add a little extra embellishment did so with a needle. Needle felting in extra details, enhancing their designs. I enjoyed myself a great deal and met a lovely group of woman- thanks for having me! 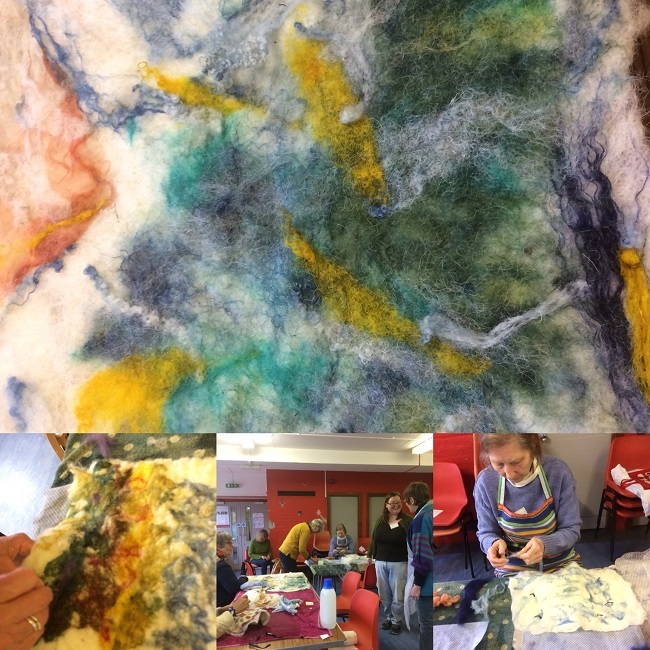 If you are interested in learning to felt with naturally dyed fleece our next weekend workshop will be April 21st-22nd. Or if you fancy getting away for longer we still have some spaces on our May Craft retreat (Fleece to Needle Felt week May 19th-26th). Natural Dyeing and Needle Felting Course/Retreat (May 19th-26th 2018).